I recently slip covered a couch for a client. I went to her house and made the main cover there. I stitched the cushion covers in my home a few days later and mailed them to her. I also brought a small ottoman and 2 throw pillows home with me from her house. I now have them all slip covered and will hopefully be delivering them to her and photographing the set-up this weekend. I also slip covered this chair for her a couple of months ago. I used the same ribbon that I used on the chair to dress up her throw pillows for her ‘new’ couch. We talked about doing the 3 stripes of ribbon on each pillow like I did on the slip covered chair. Then I mentioned a Union Jack design and she liked that idea. I am so glad because I am loving how these pillows turned out. The red and cream ribbon is French Style Organic Cotton ribbon from the etsy shop The Tin Tiara . The jute ribbon trim is from the same shop. She also carries other colors of the French Style Organic Cotton ribbon. It is one of my very favorite ribbons! I’m having a hard time convincing myself I’m really going to take them to her!! Still using my ribbon tags on my handmade items. It is on my to-do list to get something different though! Do you like the Union Jack design? 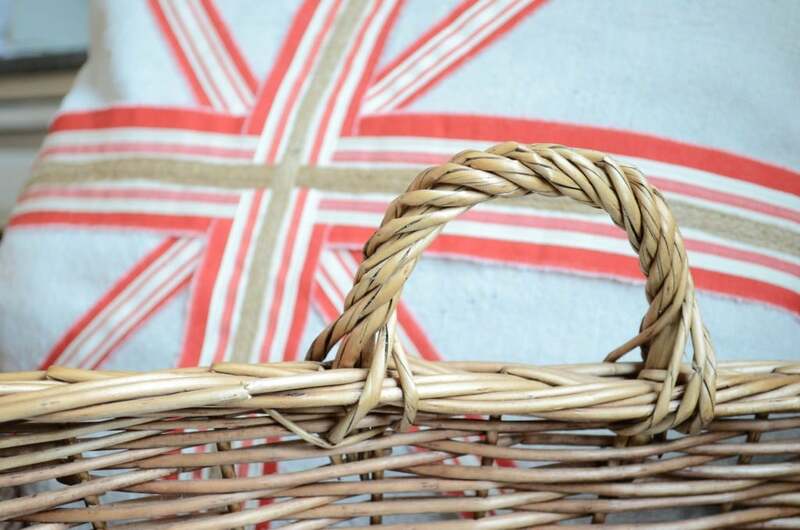 Do you own anything with this design or have you created anything with the Union Jack design? I would love to hear about it! 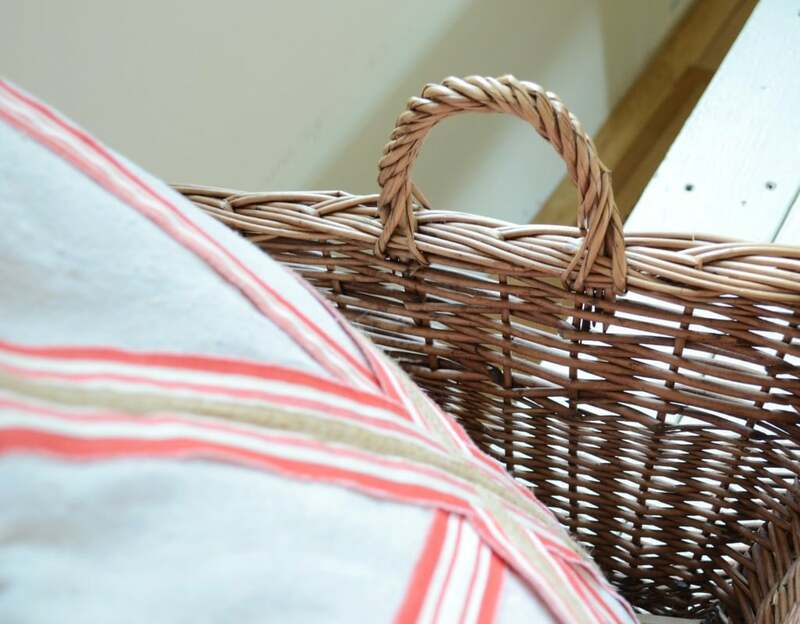 Those pillows DO look awesome in your basket! They should probably just stay! cute pillows! :) & hey – I LIKE your ribbon tags! Looking forward to seeing you tom. or Saturday! very pretty pillows! they do look nice in your basket. they are really fantastic, Jill. I love them. Make a set for your store! As usual, your skills leave me with my mouth agape. I am in total awe of your skills. I love anything with the Union Jack on it. These pillows are perfect. You need to make a set for yourself and for your Etsy shop. These are really divine. 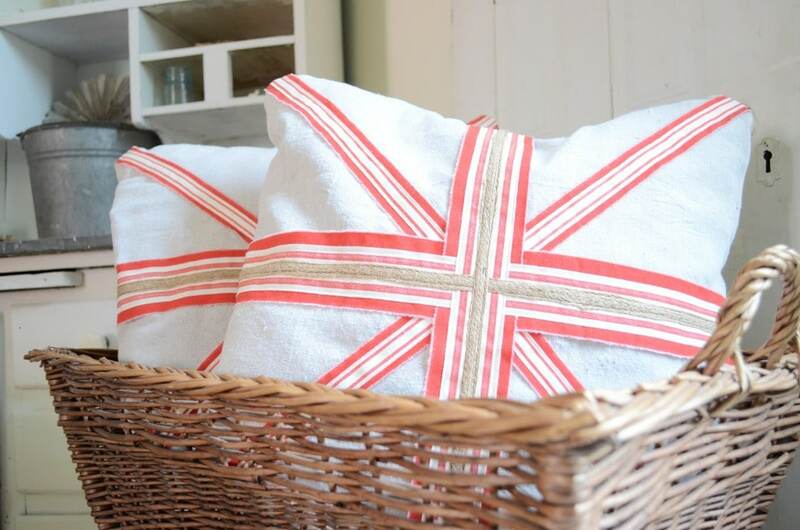 I love this union jack design over the white background and the jute ribbon trim just makes it so much special! Thank you for sharing at Freedom Fridays. Have you entered my giveaway yet? Beautiful pillows! Really nicely done! Love the colors. Wow, house calls for slipcovers, what a wonderful service! 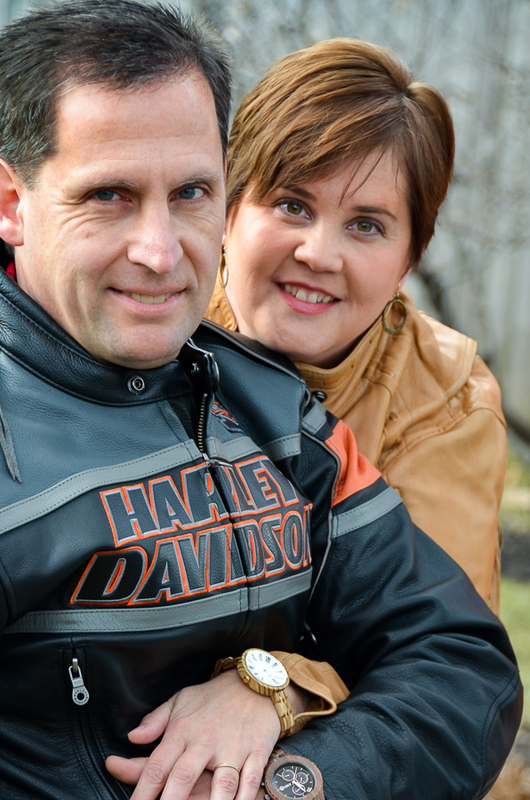 Your pillows are beautiful, you do such great work, Jill and always with an intersting custom touch. 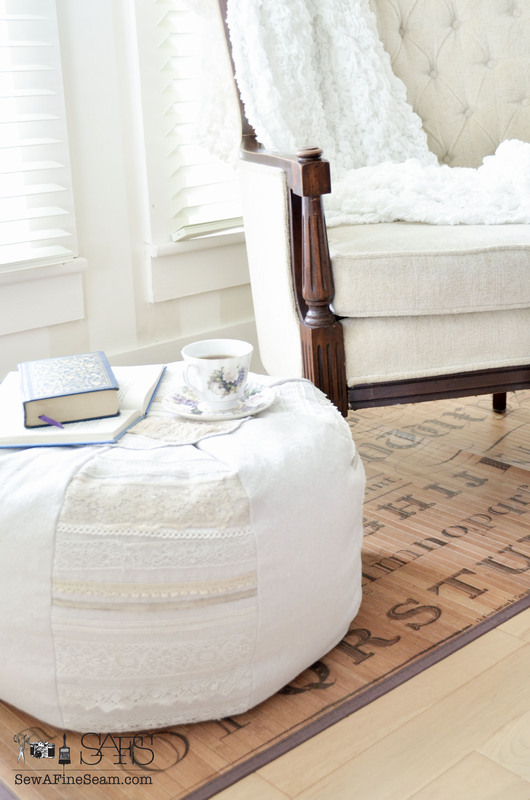 The jute with the other trim is the perfect detail. Beautiful work!! I’m still intimidated to re-upholster our chair and ottoman. I am recruiting my husband and buying a good book, because I want to get it done. Great job!! Stopping by from Polkadots on Parade linky party. Beautiful pillows! 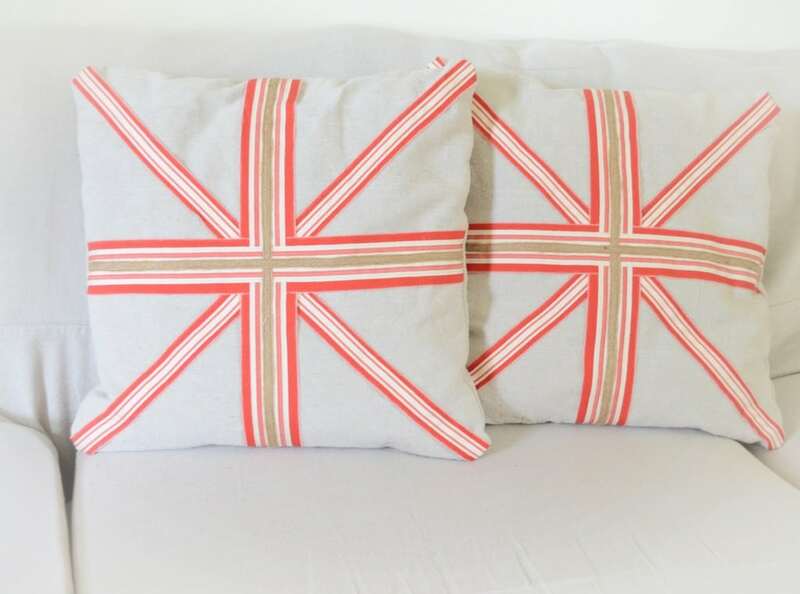 I have made some union jack pillows also, I just love how different they all can look….the sky’s the limit! Thank you for turning me on to the Tin Tiara….her shop could be addicting. Great pillows! I’m so glad you linked this idea up at One Creative Weekend! I love it! What a lovely job! I really like that color combo! I’m a bit of an anglophile so I love this, looks so soft and lovely! Oh, I love this pillow!! Thank you so much for linking to my party! Thank you! And thank you so much for hosting the monthy linky party! So fun to link up and see what other seamstresses are up to! I love your pillow! The ribbons add the perfect accent and perfect timing for the Olympics. Thanks so much for linking up to the Color party! Thanks Karianne! I just shipped two of those out today – to the lovely Laura at The Ironstone Nest who offered to do a giveaway to promote my etsy shop! And I thought too, the timing was great – and i didn’t even think of that when i made the first ones! Really pretty! Love your take on the Union Jack! Thanks! I was happy with the way this turned out! Thank you Karah! I had a hard time letting these pillows go but they look fantastic in my clients home! I love your colorful take on the Union Jack! 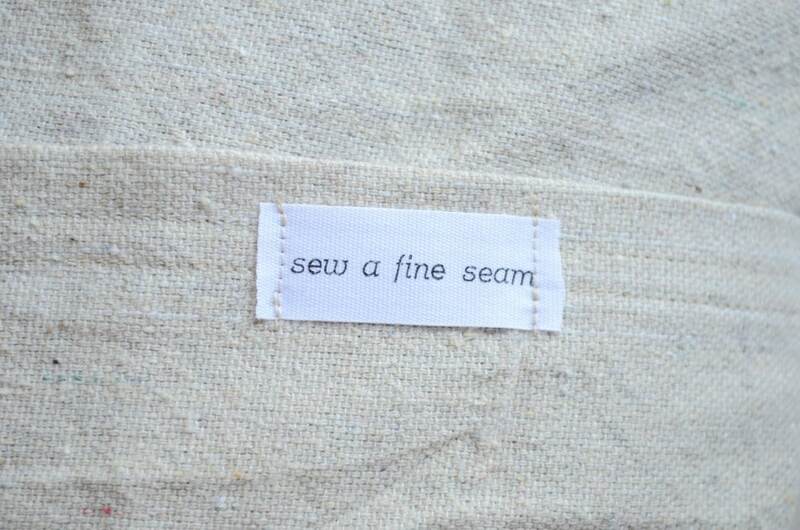 I have a tone-on-tone version in my Etsy … and just got my very own tags to sew into my pillows! The perfect finishing touch! I love Union Jack but haven’t done anything with it yet! Oh, and I can’t sew a stitch either (shame)! Your pillow (and cute little tag) is fabulous – so glad you joined our Color party! Thanks for hosting Kelly! Lots of fun stuff linked up over there – I hope to get time to come back and browse through more of it! Thank you Britni! I will be back if I can squeeze in the time this week! We have VBS all week in the evenings – I am the photographer. It’s wearing me out! Thank You Alison, and thanks for hosting the party! Always fun to see all the great stuff linked up! Sherry, it is so fun to join your party! Thanks for hosting!